Home → News → Looking for Google Scholar? Google Scholar is a great resource and excellent tool for researchers. It searches the academic, scholarly web for peer-reviewed papers, theses, books, abstracts, and articles. 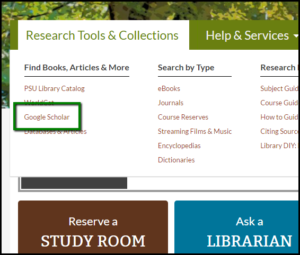 In order to get the most out of Google Scholar off campus, you should connect it to PSU Library. 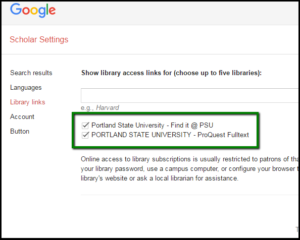 First, go to ‘Settings.’ Next, click on ‘Library links’ and search for “Portland State.” You should see several results for resources available through the PSU Library, shown in the image below. Check these resources and save your settings to connect to Portland State University Library. With this option turned on, Google Scholar will identify full text articles available from PSU Library resources. Additionally, you will discover open access articles from other universities and colleges. Additionally, you can access Google Scholar in the list of Research Starting Points on the Databases and Articles page. Finally, access Google Scholar in the alphabetical list of databases, under G.